Distinguished guitarist Mike Stern performed a full band concert at Schwartz auditorium during the evening of October 1, 2018. In the Spring of 2014, Stern, Artist-in-Residence, hosted two hands-on jazz clinics with students and a concert in Nicholson Hall. What do Blood, Sweat & Tears and Billy Cobham have in common? They both signed Stern while he was in his 20s. The jazz maestro then got a break when Miles Davis brings him onboard Davis’ own comeback album The Man with the Horn in 1981. Wilson refers to an injury that happened in 2016. In New York City nearby Stern’s apartment, he fell and broke both humerus bones while hailing a cab before leaving for tour two years ago on July 3. The incident left nerve damage that impaired his ability to hold a pick with the right hand. As a result, Stern glues the pick to his hand in order to hold it in place while he strums. His injury did not keep Stern from the recording studio for long. The dedicated musician released a comeback solo album Trip in the fall of 2017. Stern has been on tour since then. 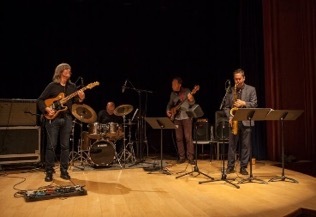 The band lineup at his most recent StFX performance features Stern on guitar, Tom Easley on bass, Kenji Omae on saxophone and Tom Roach on drums. Easley, Omae and Roach are professors of Music at StFX. Once in a while, when the band was jamming, Stern would shout “Yeah, man!” or stick his tongue out. The musician from Boston, Massachusetts was unreserved, intimate and funny. The band brought to life the classic “Red House” from Are You Experienced by The Jimi Hendrix Experience as the encore song. Stern claimed it to be the only song from Hendrix he knows how to play, and he played it masterfully. “It’s the best performance I’ve seen here. Mike is a gifted guitarist and vocalist who has performed with the likes of Miles Davis. Fusions particularly stood out for me. Mike usually plays in unison with the saxophone, bass and his back and forth with the drummer tonight was mesmerizing.” Said jazz student Jerry Ko post-show. Stern stuck around to meet Ko and other audience members after the concert and sold out all copies of his latest album Trip. While the performance was stellar, a part of me questions why the best venue on campus was booked for Stern on Treaty Day? Our Treaty Day event, including the appointment of Kerry Prosper as Knowledge Keeper, is undermined when hosted in the lower-quality venue with fewer seating. Stern goes on to play gigs in Paraguay, Norway, Belgium and Germany among other places around the world in the next two months. The traveling musician leaves a lasting impression on our university. Stern’s infectious passion for jazz inspires just about anyone to pick up and play an instrument.